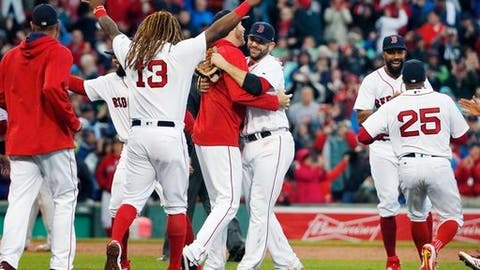 BOSTON (AP) David Price came on in relief of Drew Pomeranz and squelched a dangerous seventh-inning rally to help the Boston Red Sox beat the Houston Astros 6-3 on Saturday, clinching the first back-to-back AL East titles in franchise history. Lance McCullers (7-4), who was pitching for a spot in Houston’s postseason rotation, allowed five runs and six hits in 4 1/3 innings. ST. LOUIS (AP) – Milwaukee was eliminated from playoff contention when it squandered a six-run lead in a loss to St. Louis, handing baseball’s final postseason spot to Colorado. Brewers reliever Anthony Swarzak (6-4) gave up a tying, two-run single to Stephen Piscotty in the eighth inning and a go-ahead single to Harrison Bader. Milwaukee tried to rally in the ninth, but Brett Phillips struck out with a runner on second to end it. Milwaukee’s loss clinched the second NL wild card for Colorado, which plays at division rival Arizona in the wild-card game Wednesday. The winner advances to a best-of-five Division Series against the NL West champion Los Angeles Dodgers. Ryan Sherriff (2-1) pitched a scoreless inning for the win, and Juan Nicasio worked the ninth for his sixth save. WASHINGTON (AP) – Nationals ace Max Scherzer was pulled with a hamstring cramp while tuning up for the playoffs. The Nationals said Scherzer was sent for a precautionary MRI on his right hamstring. Manager Dusty Baker downplayed the severity of the injury. The Pirates rallied with four runs in the ninth inning off Brandon Kintzler (2-1). Sean Rodriguez singled home the tying run with Pittsburgh down to its final strike. Max Moroff added a bases-loaded triple. MINNEAPOLIS (AP) – Andrew Romine became the fifth player in baseball history to play all nine positions in one game, helping the Tigers to the win. Romine, a 31-year-old utilityman, played catcher for the first time in his career and got one out on the mound. He was the first player to accomplish the feat since Shane Halter for Detroit against Minnesota on Oct. 1, 2000. Buck Farmer (5-5) pitched five strong innings for the win and Shane Greene recorded his ninth save. Aaron Slegers (0-1) took the loss for the Twins, allowing three runs in 4 1/3 innings. NEW YORK (AP) – Aaron Judge hit his 52nd homer, powering the Yankees to the win. The Yankees will host Minnesota in the wild-card game Tuesday after the Red Sox clinched the AL East title with a 6-3 victory against Houston. Replacement starter CC Sabathia (14-5) won his fifth straight decision. With New York still in contention for the division title to begin the day, manager Joe Girardi opted for Sabathia to pitch on his regular four days’ rest in place of the originally scheduled Jaime Garcia. Aroldis Chapman pitched a perfect ninth for his 22nd save in 26 chances. Toronto right-hander Marcus Stroman (13-9) allowed two runs and six hits in four innings. The Blue Jays scored in the eighth on Josh Donaldson’s sacrifice fly. SAN FRANCISCO (AP) – Matt Cain pitched five shutout innings for San Francisco, then raised his arms and waved his cap, fighting off tears amid a standing ovation as he walked off the mound for final time. Cain’s decorated 13-year career came to an end and the home crowd at AT&T Park saluted the right-hander, a cornerstone of the Giants’ championship era who pitched the only perfect game in franchise history. Cain made his last start a day ahead of his 33rd birthday and at the close of a $127.5 million, six-year contract. Beset by injuries in recent years, Cain has said he couldn’t imagine pitching for another team. Wil Myers hit his 30th homer off Giants reliever Reyes Moronta in the sixth. San Diego jumped in front in the ninth on Austin Hedges’ two-out, two-run double off Sam Dyson (3-4). Buddy Baumann (2-1) pitched a scoreless eighth and Brad Hand worked the ninth for his 21st save. MIAMI (AP) – Miami slugger Giancarlo Stanton remained at 59 home runs, but Derek Dietrich connected for the Marlins. Stanton went 1 for 5 and drove in a run. He has one more game to become the first player to hit 60 home runs in a season since 2001 when Barry Bonds hit 73 and Sammy Sosa hit 64. Dietrich drove in three runs, and Odrisamer Despaigne (2-3) pitched seven innings of two-run ball. Atlanta right-hander Lucas Sims (3-6) allowed six runs in two innings. CLEVELAND (AP) – Carson Fulmer pitched five strong innings and Kevan Smith drove in two runs, leading the White Sox to the road win. Cleveland clinched the best record in the AL earlier in the day when Houston lost to Boston. The AL Central champions will play the winner of the wild-card game between the Yankees and Twins in the AL Division Series. Michael Brantley had a pinch-hit single in the fifth for Cleveland, marking his first game action since spraining his right ankle on Aug. 8. He worked Fulmer (3-1) for a 10-pitch at-bat before sharply singling to right. Smith doubled off Mike Clevinger (12-6) in the sixth, scoring Avisail Garcia for a 2-1 lead. His RBI single in the fourth off Corey Kluber scored Jose Abreu. Juan Minaya tossed a perfect ninth for his ninth save. CHICAGO (AP) – Jon Lester struck out seven over five innings, Kyle Schwarber hit his 30th home run and the NL Central champion Cubs earned their 15th win in 18 games. Lester (13-8) allowed four hits and walked none in a possible tuneup for Game 1 of the NL Division Series against Washington. The veteran left-hander has allowed one run in 11 innings over his past two outings after posting an 8.22 ERA in his previous five starts. Schwarber finished with four RBIs. He hit a two-run drive in the second and a two-run single in the third against rookie Jackson Stephens (2-1). The last-place Reds lost for the 10th time in 11 games. ST. PETERSBURG, Fla. (AP) – Chris Archer won for the first time since Aug. 22, and Brad Miller hit a three-run homer for the Rays. Archer (10-12) pitched five shutout innings before two relievers helped stretch Baltimore’s scoreless streak to 23 innings. Pedro Alvarez halted the drought with a two-run single off Tommy Hunter in the eighth. Alex Colome pitched the ninth for his major league-leading 47th save in 53 tries. Baltimore put runners at the corners with no outs, but only managed Anthony Santander’s sacrifice fly. Miller connected against Miguel Castro (3-3) in the fourth for his ninth homer. Kevin Kiermaier scored on Wilson Ramos’ sacrifice fly in the seventh.